As promised, I thought I’d show you our most recent family adventure trip! 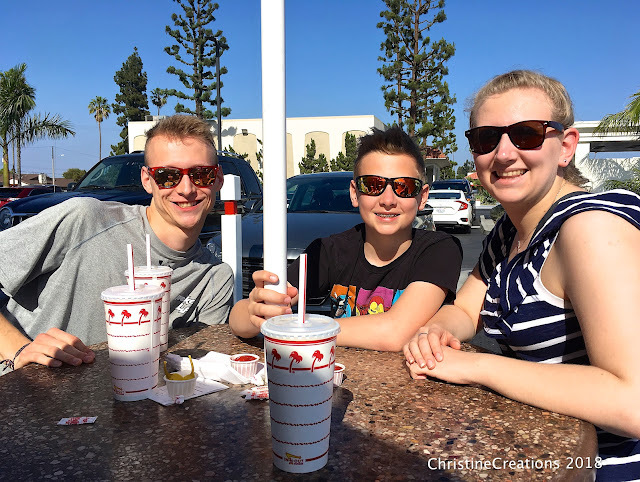 A few weeks ago our family of five celebrated a bunch of things, including our daughter graduating from University with an Elementary Ed degree, by heading to one of our favourite places, sunny Southern California! This post will be jam-packed with a LOT of pictures from the trip. 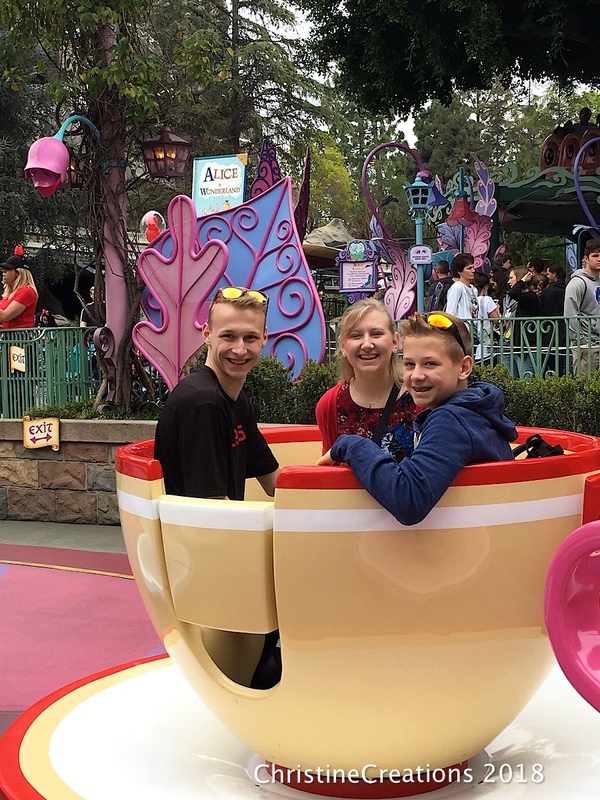 We’ve been to Disneyland twice before with the kids, the last time about 11 years ago. 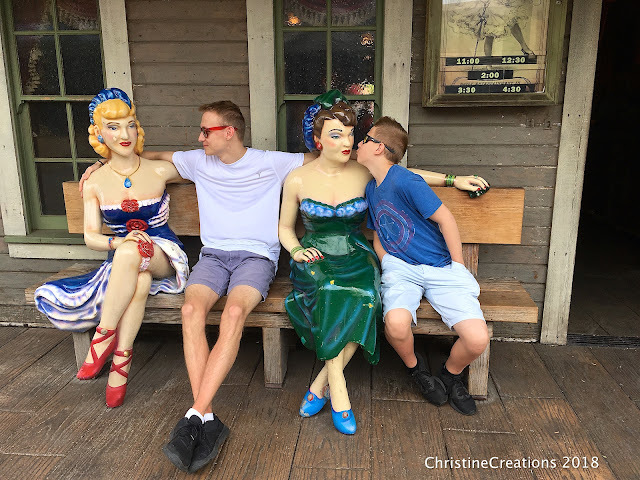 Though the older two remember it fondly, our youngest who’s 14 really doesn’t remember those trips, so this trip was like his first time, (which was kind of fun). We debated taking a big trip to a lot of different places, but settled on California again because it holds such good memories for us, and with all the kids basically being young adults, we could ride every single ride and go as long and hard as we wanted to each day. It was not a “relaxing” vacation, but WOW was it FUN! 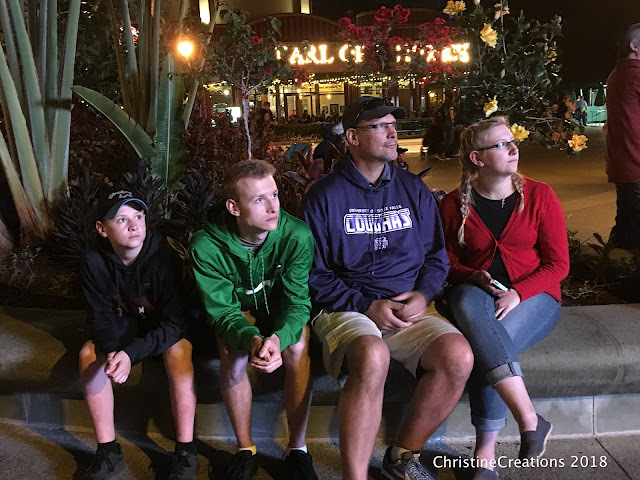 We went for 9 days, did a 5-day Park Hopper for Disneyland and California Adventure, a day at Knott’s Berry Farm for the rollercoasters and a day at the beach. 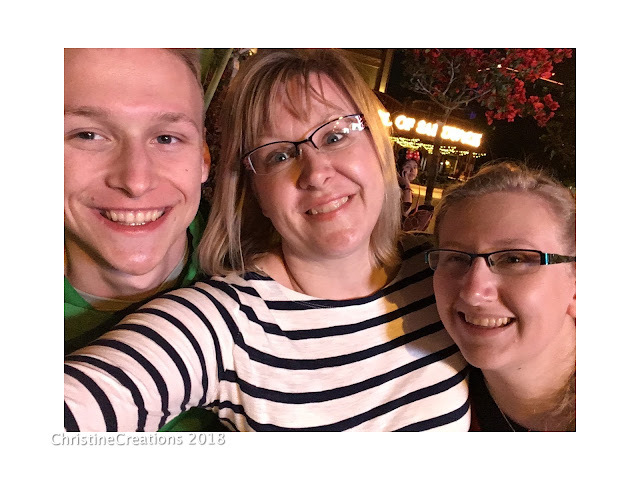 We built so many good memories together, knowing that there may not be too many trips like this with all five of us, so we wanted to make the most of our time. The weather was beautiful. Most days were in the upper 70’s to mid-80’s with cloud in the morning, and sunshine the rest of the day, just one day we had some drizzle. Everything was beautifully green and blooming. Since our spring was so slow in coming at home, it was such a nice treat to soak up the sun. Crowds were busy, but we’re getting to be pros at how to do the parks. 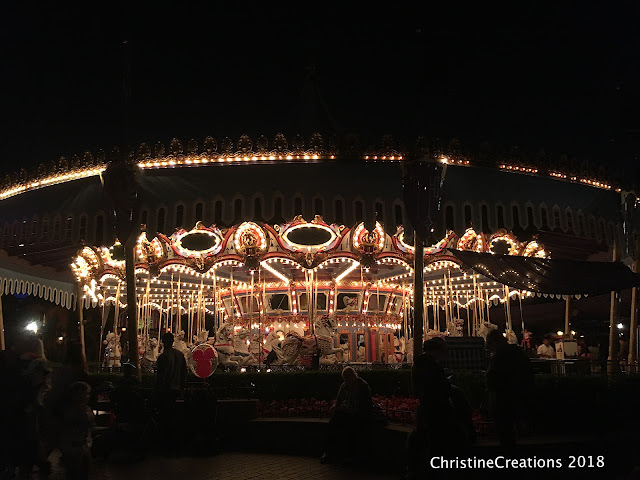 We arrive before the parks open, and in the first two hours when it’s quiet we ride everything we can. Most of the time we didn’t wait much, and we always make good use of our Fastpasses. 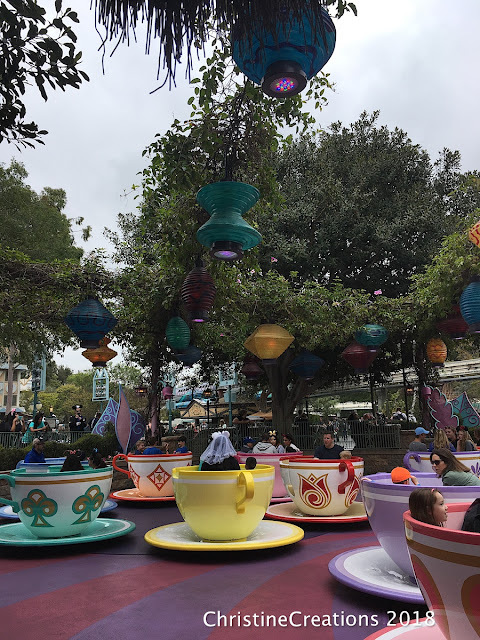 With 5 whole days at the parks, we did 2 at Disney, 2 at California Adventure and then what we call our “favourites day”, where we hop back and forth between the parks to our favourite rides. We rode everything we wanted to multiple times. Some of the iconic Disney rides. I loved seeing our kids enjoy each other and do goofy things. On the teacups, our older son spun the cup as fast as he possibly could go. He also made the most noise on the entire ride and the crowd was laughing at him and taking videos. It’s never dull. Did you know they improved the Yeti monsters on the Matterhorn? 100 X better and scarier! I always thought they were kind-of lame before. Not anymore! Try the left track (lining up on the Tomorrowland side) we think it’s a faster track :)! Of course you have to do It’s a Small World at least once. It’s also a great break from the heat because it’s mostly indoors. This is the view from Tarzan’s Treehouse at sunset! So pretty! 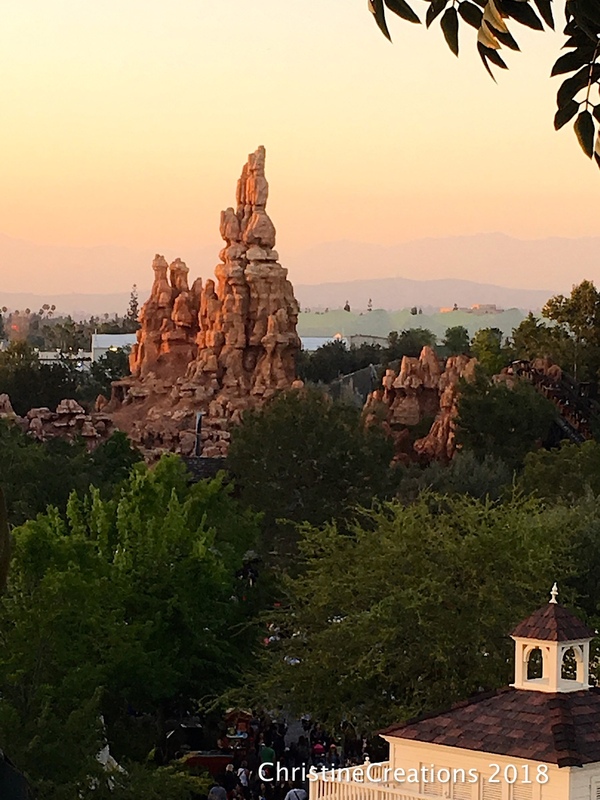 And you can catch a glimpse of Big Thunder Mountain Railroad, which is our family favourite Disney ride, I think we rode it 9 x this trip! 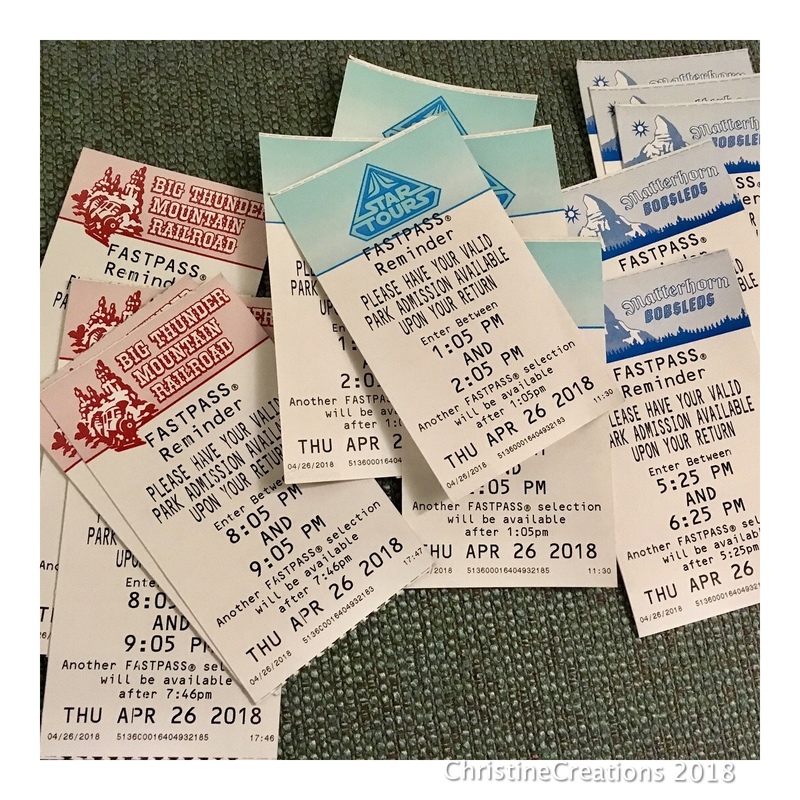 Fastpasses are a must. 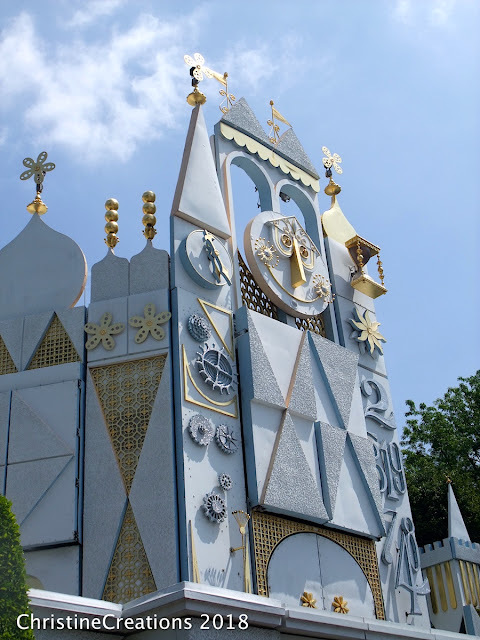 You can save SO much time in line on the rides with very long lines, and each Fastpass tells you when you can pick up your next fastpass, so at times you can hold a couple at once - depending on when the ride is scheduled. 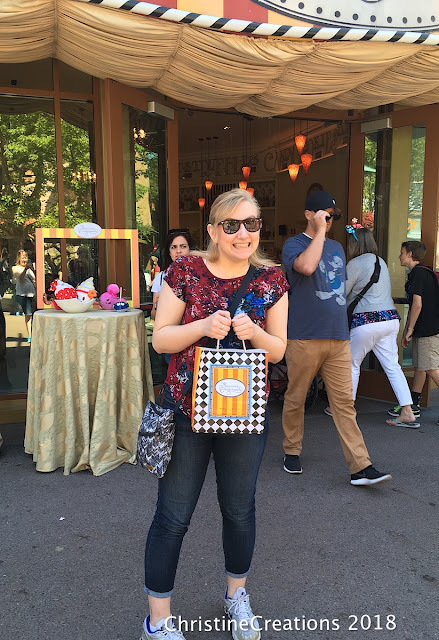 One of the gems of Disneyland are the fun snacks they are known for. People love the Dole Whips, Churros, Pretzels, and Turkey Legs. One of our favourites is the Apple Pie Caramel Apples. So you can see our daughter has them safely in that bag. 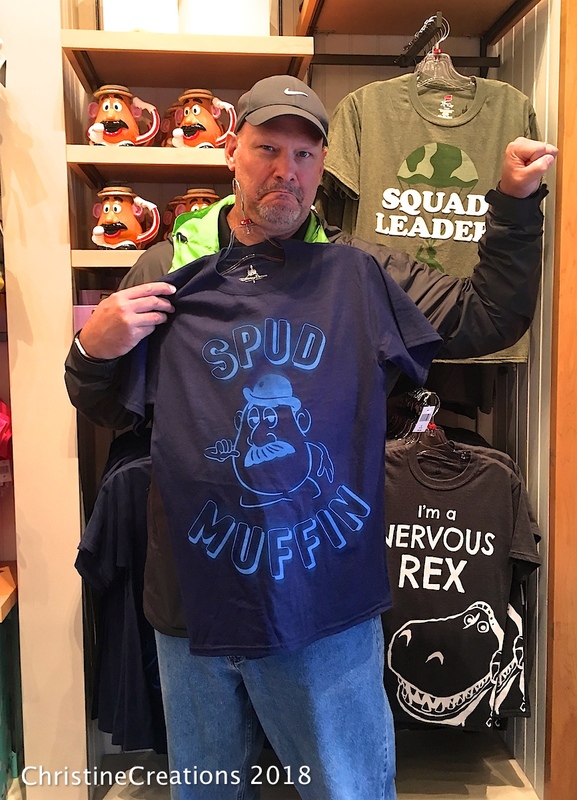 They’re a crazy price (like a lot of things at Disneyland, $12 US). But for a one time treat we have such fond memories of, we just had to do it again. They are amazing! 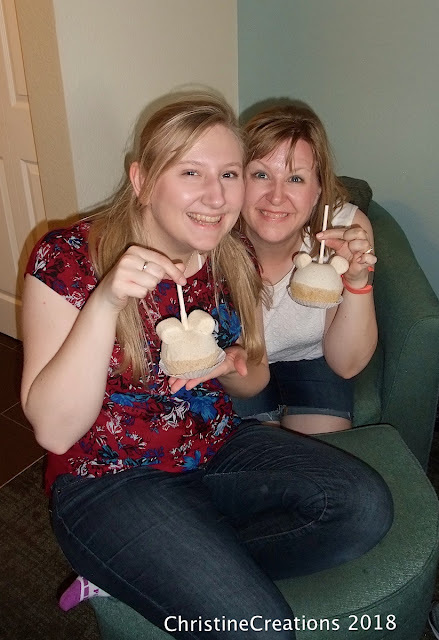 And, of course they are Mickey shaped! You can tell we’re a little tired here. We typically walked about 20 000 steps a day. And really it’s not the walking that makes you tired, it’s more the standing in line. A lot of people were smart and played “Heads Up” on their phones, but we didn’t want to pay for internet/data out of the country, so we did often played Disney themed guessing games like that, just with clues and guessing. 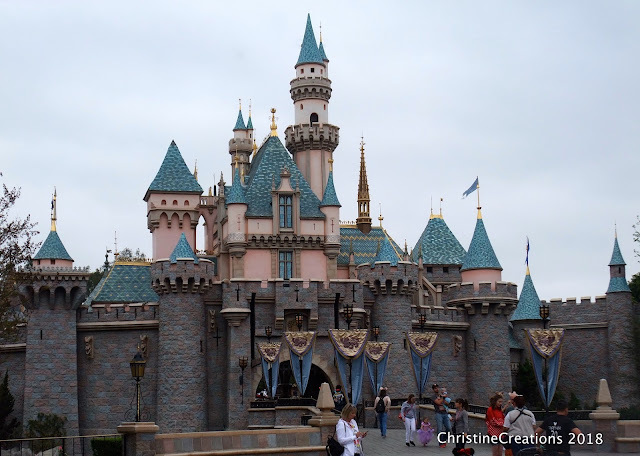 Disneyland is known for it’s “mountains”: Space Mountain (another family favourite), the Matterhorn, Big Thunder Mountain and Splash Mountain. 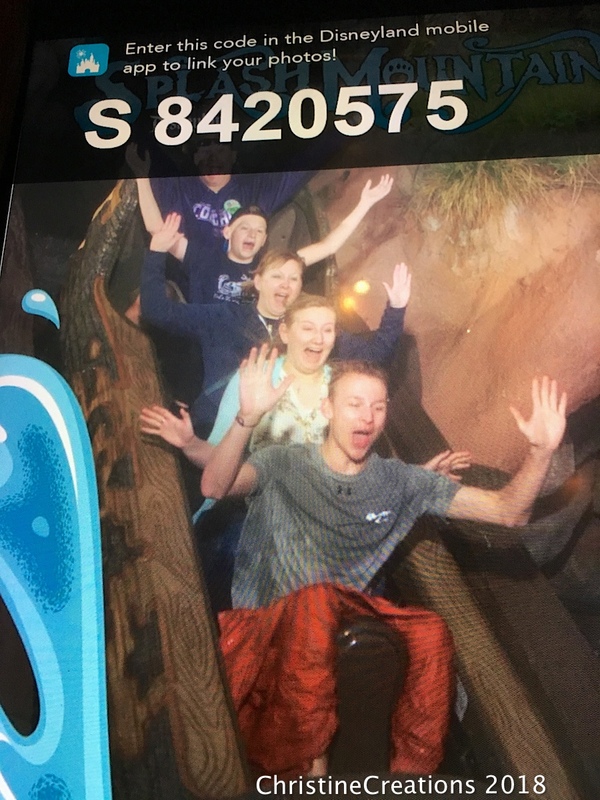 In the other two times we were at Disneyland, this ride was closed for maintenance, so this was the kids first time on it...one morning we rode it back-to-back and got thoroughly soaked. The carousel at night is so pretty. 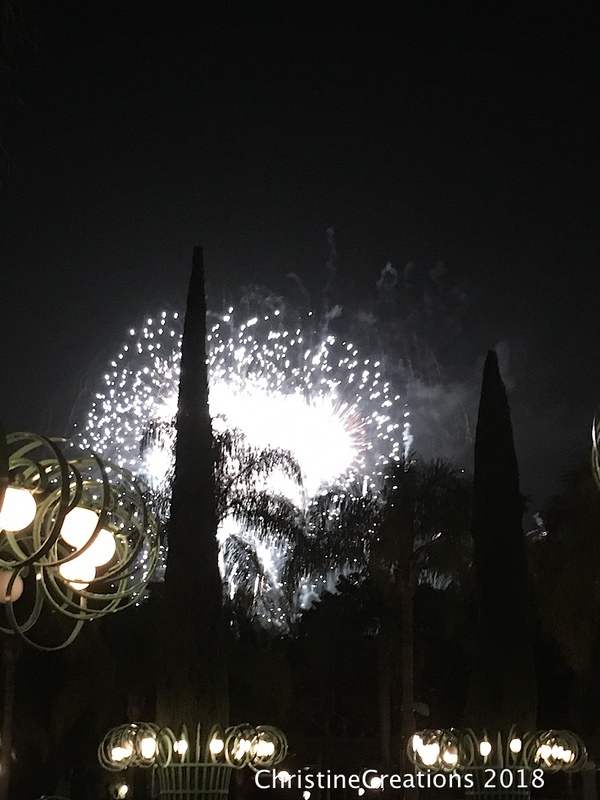 Fireworks are every night at 9:30 pm. Though we saw it from inside the park we also sat in Downtown Disney (the shopping area outside the Parks), and just watched it from there. Apparately Disney is one of largest purchasers of explosives in the world (just behind the US military). It shows, the fireworks really are great. 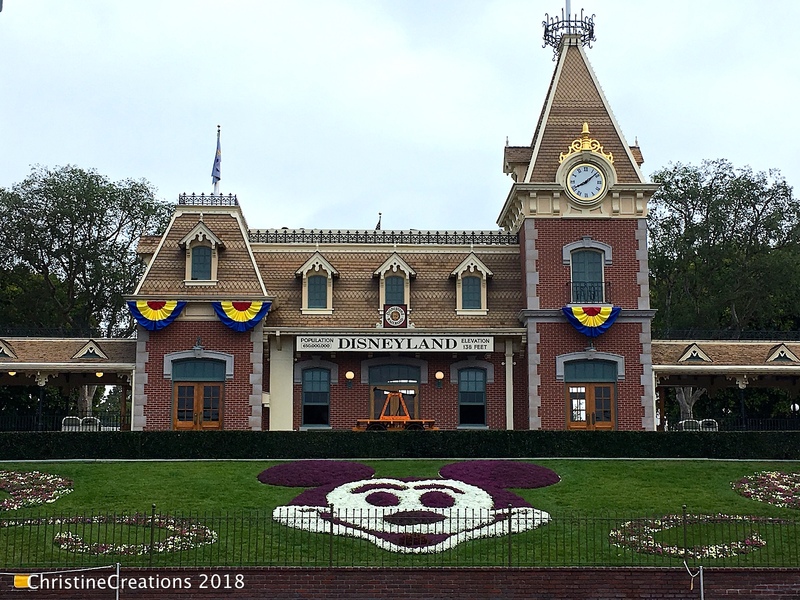 Disneyland does everything so beautifully, professionally, with such class. 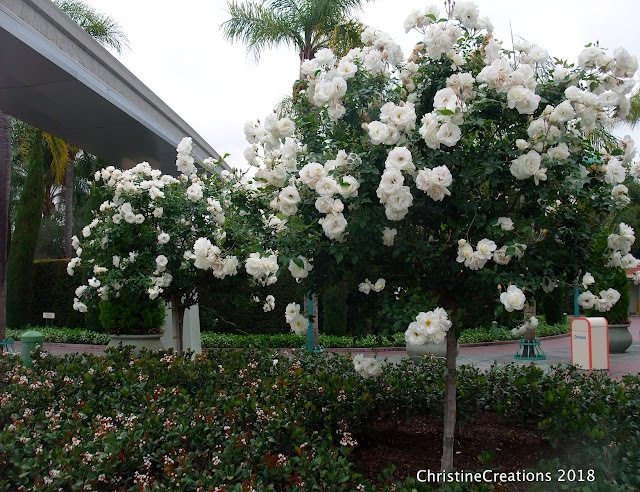 These are beautiful rose (trees?) outside the park near the picnic area. Next up, California Adventure! 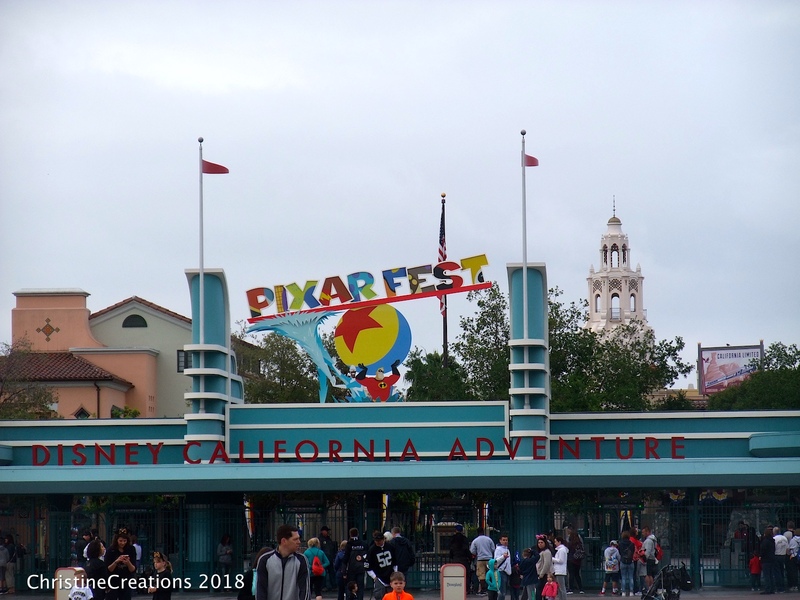 It was Pixar Fest while we were there, celebrating all the movies done for Disney by Pixar Studios, so there were lots of extra things done, and themes throughout the park. 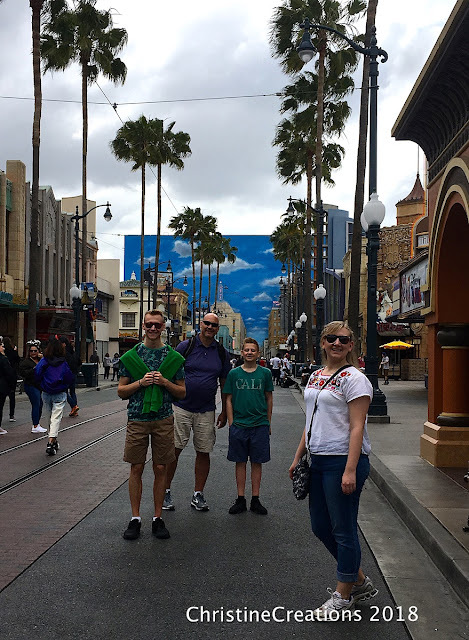 Here we are at Hollywood Land where a lot of the shows and animation features are located. And it’s also the home of our favourite ride at California Adventure, Guardians of the Galaxy. 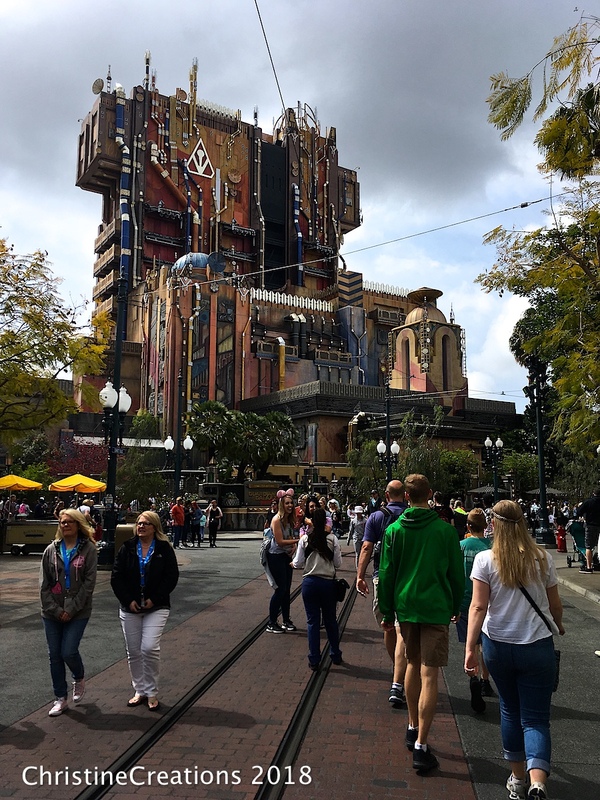 It’s a drop ride that showcases an adventure with Marvel’s Guardians of the Galaxy. The ride shoots you up and drops you down randomly to songs from the movie from Starlord’s Walkman. It stops and open the doors to different scenes with the Guardians. Once I got used to the drops (it’s not usually my favourite type of ride because I don’t like heights), I absolutely loved it, and would laugh the entire time. New at California Adventure is Cars Land, celebrating the Cars Disney movies. Wow they’ve done this one up so well! You travel up Route 66 to all the stores and characters from the movie. It is really cute. 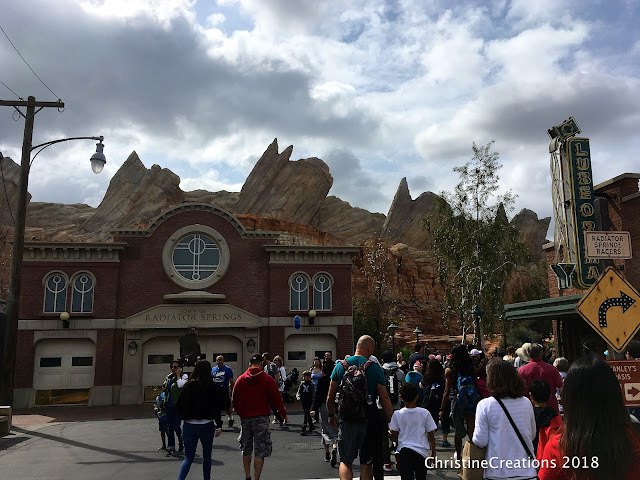 The Radiator Springs ride is really fun too, we did it twice and that was enough for us, but if you had younger kids, I can see this section being one of their favourites. Another cute ride in Cars Land is Luigi’s Rockin’ Roadsters. 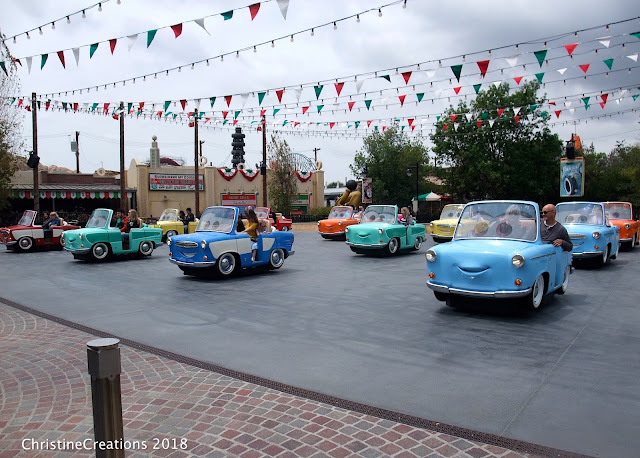 The little micro cars dance together to routines from about 6 different songs. Really fun! One of the new things they are developing at California Adventure is Pixar Pier, and it will be fully open later this summer. This is a scale model of some of the changes. 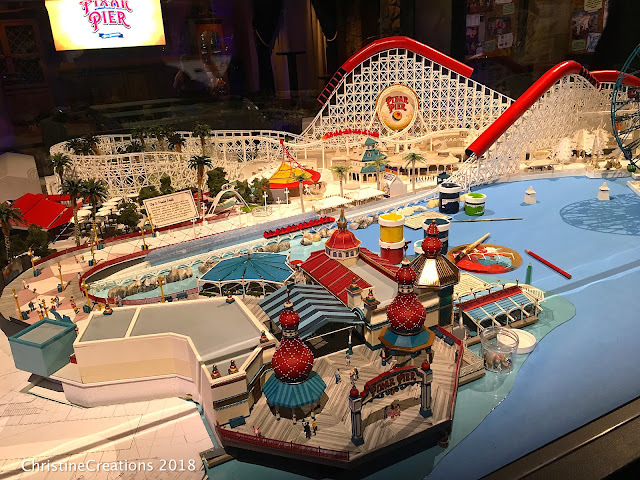 California Screamin’ Rollercoaster was closed because it’s becoming the IncrediCoaster (I think it’s going to be amazing - they’ll show scenes from the Incredibles movies in those red tubes, plus the amazing fast coaster). They’re also making the ferris wheel into a Pixar Themed ride. One ride already open is Toy Story Midway Mania (a 3D ride where you shoot things much like Buzz Lightyear at Disney), it was also one of our favourite rides we rode there. Pixar Pier also had a store that had our favourite t-shirt themes. Aren’t these a kick? 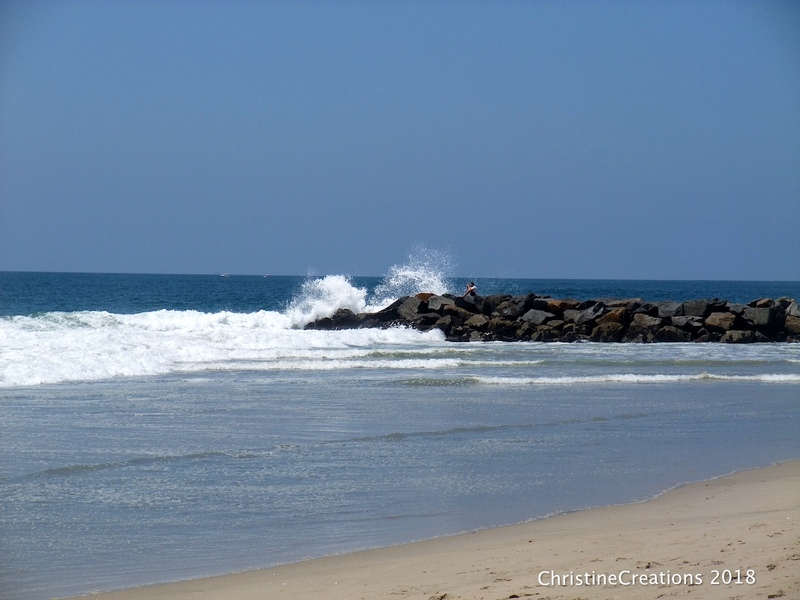 Next up, a day at Newport Beach! 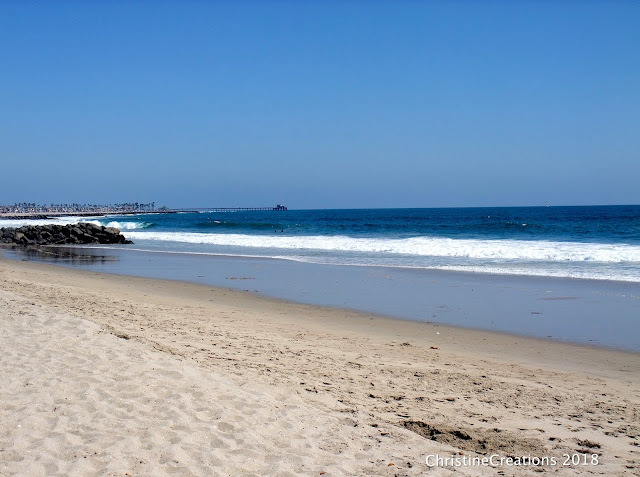 It was a gorgeous day, and we managed to find a part of the beach that was more residential so it was really quiet. 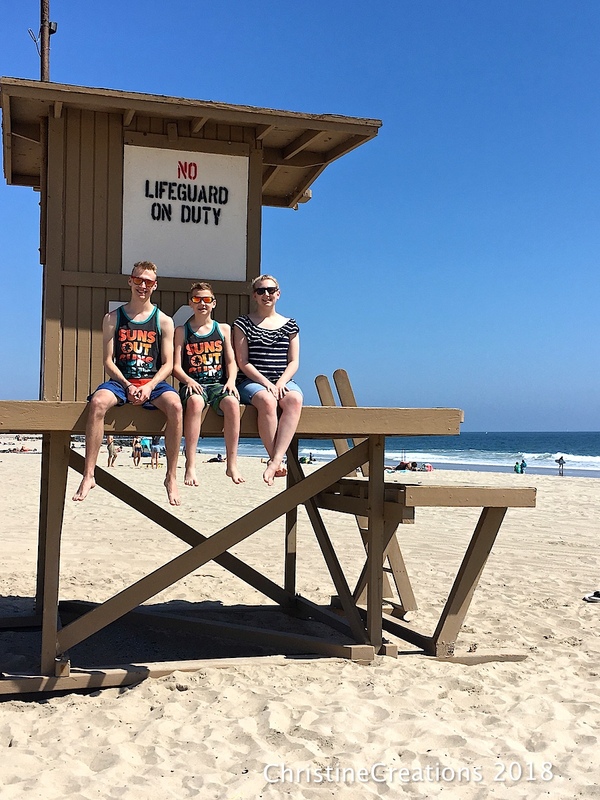 We soaked up the sun and despite good sunscreen, most of us burned, especially our older son who forgot to put it on his feet and then he fell asleep in the sun. The waves were great for some quick dips in and watching some surfers. OH my cuteness! Ages 10, 7 and about 3. Their auntie bought them these matching shirts (their cousin has one too) so the boys had to bring them out for the beach. 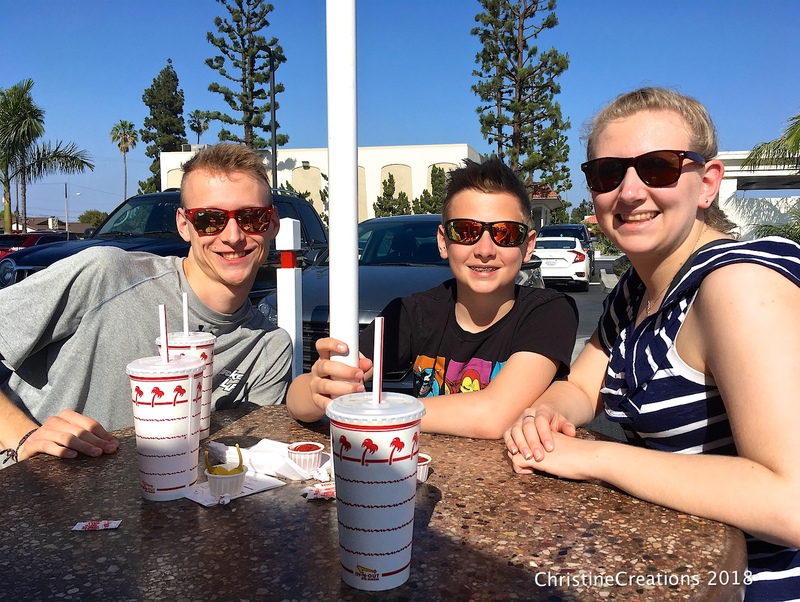 Of course a day at the beach has to end with a meal at In N Out. Our favourite west coast burger joint! One night we hung out at Downtown Disney and watched the NHL Stanley Cup Playoffs on the big screen at the ESPN spot. That was fun. We were cheering for Vegas on this night. Next up, Knott’s Berry Farm! I can’t stop myself from taking pictures of beautiful flowers! 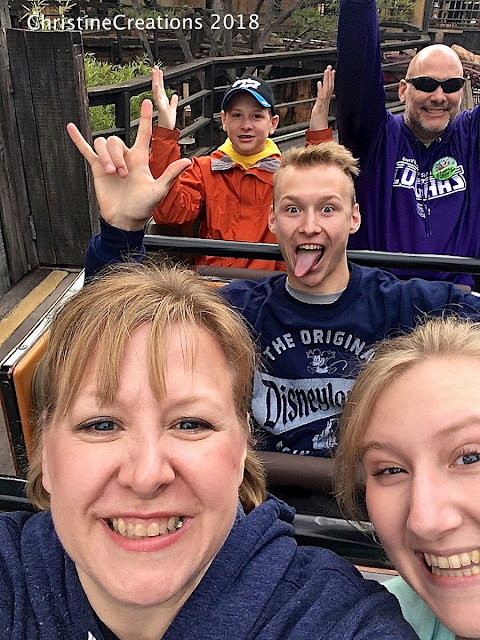 We wanted the kids to experience big rollercoasters, and Knotts is fun, and a little more quiet. 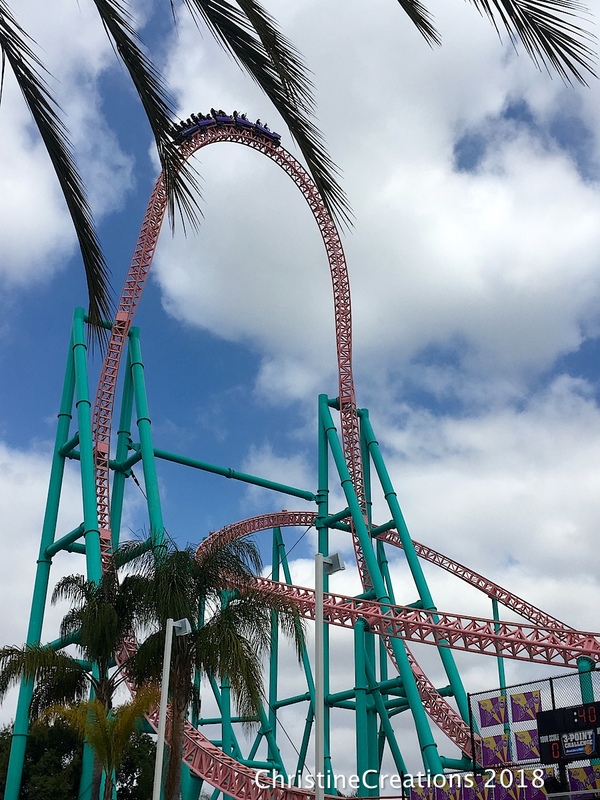 Check out this one the XCelerator which goes 80 miles per hour in 2 seconds. Those drops hey? My fav ride at Knotts is the Silver Bullet where your feet hang loose (no bottom) and do some crazy 360 spins. Another one of those iconic shots at Knott’s. I teased that this is a bit of my boy’s personalities shining through. 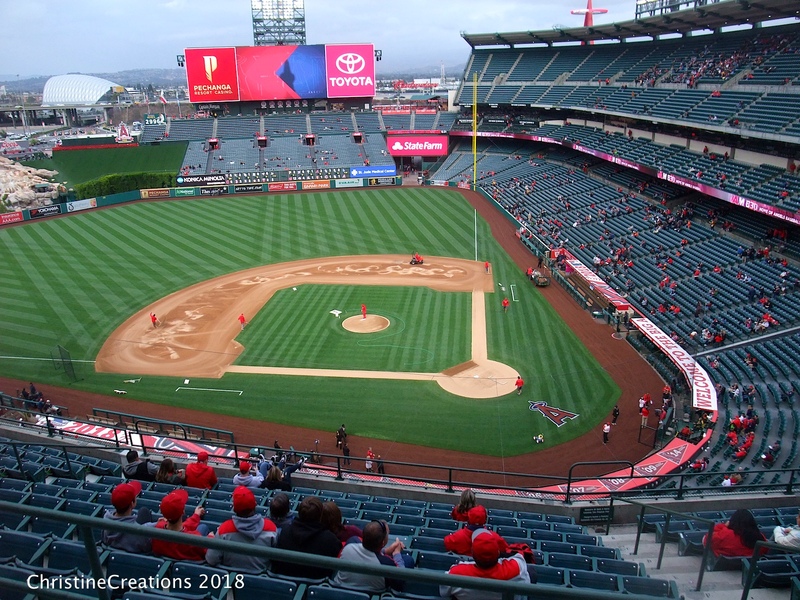 One way we surprised the boys was by taking them to an MLB game with the Angels vs. the Orioles. 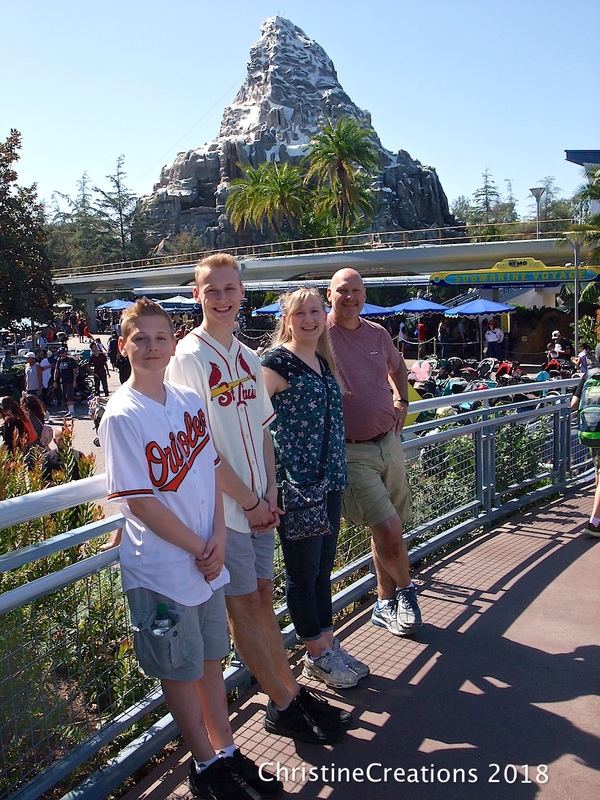 The Orioles are our youngest son’s FAV team in the MLB, and they’ve never been to a game. Finding out they were playing the Angels was such a sweet surprise. The tickets were only $8 a piece and the stadium was within 5 minutes of our hotel. One of our sweetest memories of the trip actually came on the last day. We were are the park early like usual and managed to be first in line at “rope drop”. 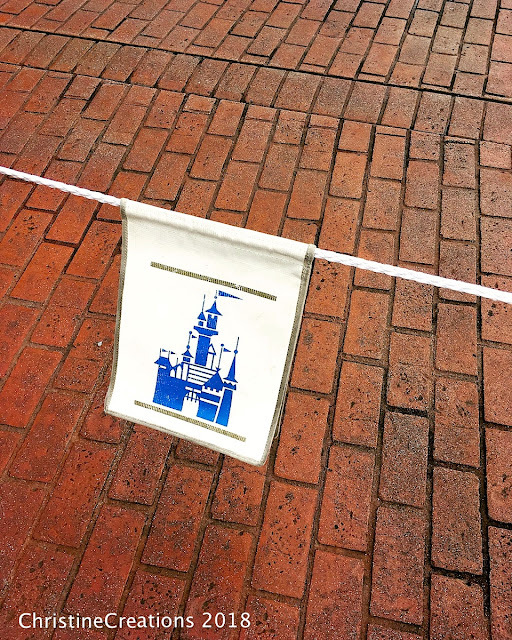 They let you into the gate a half hour early and allow you to go into Main Street as far as the “rope drop”. When the park opens they drop the rope and everyone can flood into the park. 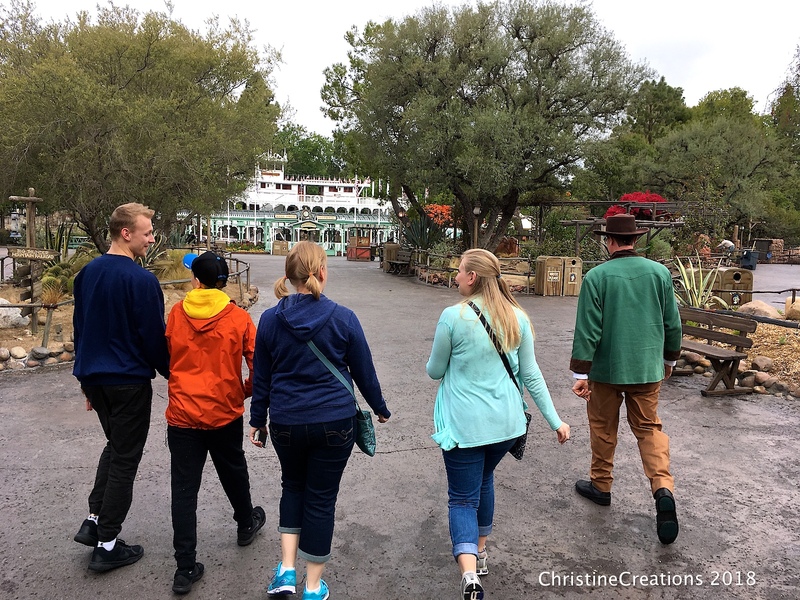 As we were waiting at the rope before the drop before the park opened, a Cast Member came up to the rope and asked if anyone was heading to Big Thunder Mountain, I said that we were. He responded by opening the rope and said “follow me!”. We got to “test-track” drive Big Thunder Mountain before the park opened and before anyone was allowed in! What a special surprise. And finally, to finish our last day, we rode our favourite ride in California Adventure, Guardians of the Galaxy. This is the shot they take at the top of the ride when they open the doors before they drop you again. We’re all in the front row having a great time. 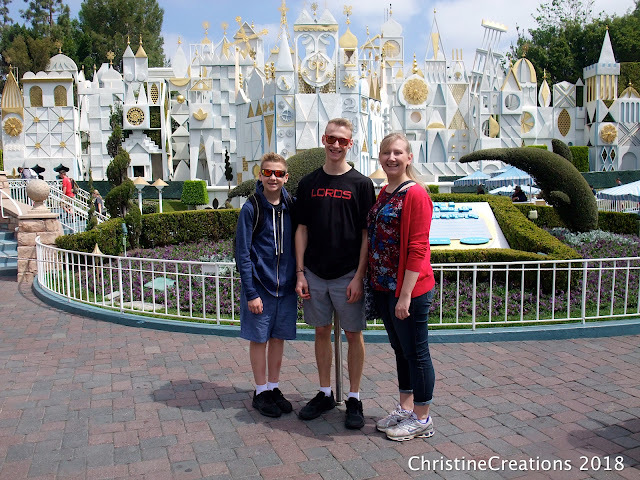 It was an epic California Adventure! Thanks for sharing it with us! 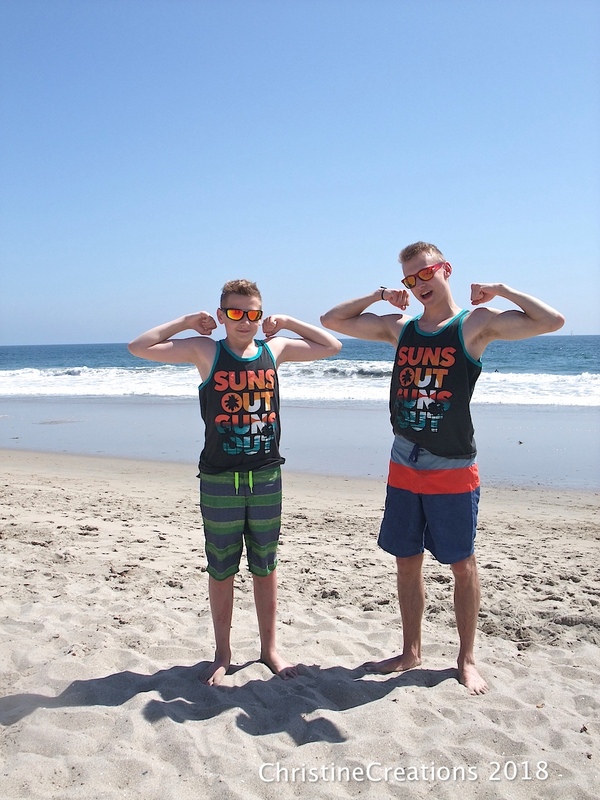 Thanks for sharing your Cali vacation. That is my home. It was a family tradition we went to Disneyland the day after Christmas every year. I remember when Knotts Berry Farm was really a farm with just a few attractions. 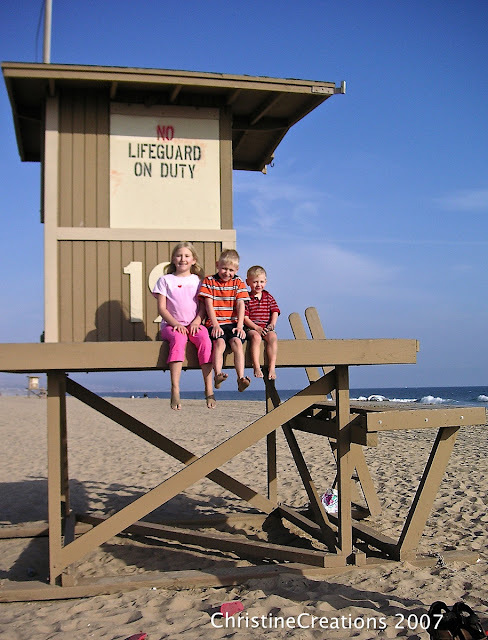 I live in Missouri now but before I left Cali I lived in Newport Beach for several years. 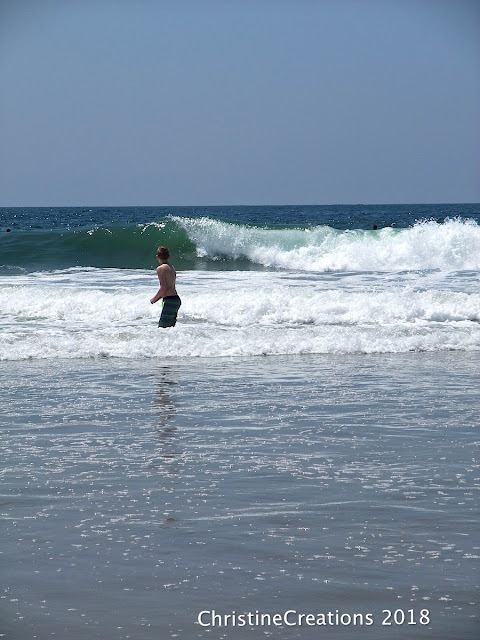 I so miss California sometimes. I go there about every two years. 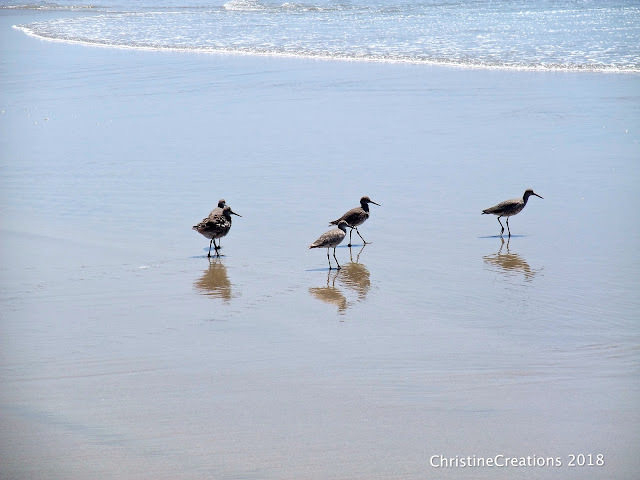 I love to fly into San Francisco and drive to San Diego and going to all kinds of places in between. You brought back a lot of memories with your vacation. I have family pictures of the four of us in the same spot each year. Thanks for the pix... they r Great and will be memories FOREVER. Looks like you had a fabulous time and how great to have this time with the kids all together, you don't know how long you will all be able to get together like that, those times are so precious. Great memories you all have of this time! I have never been to these parks but I have motion sickness and so there aren't too many rides I can go on. 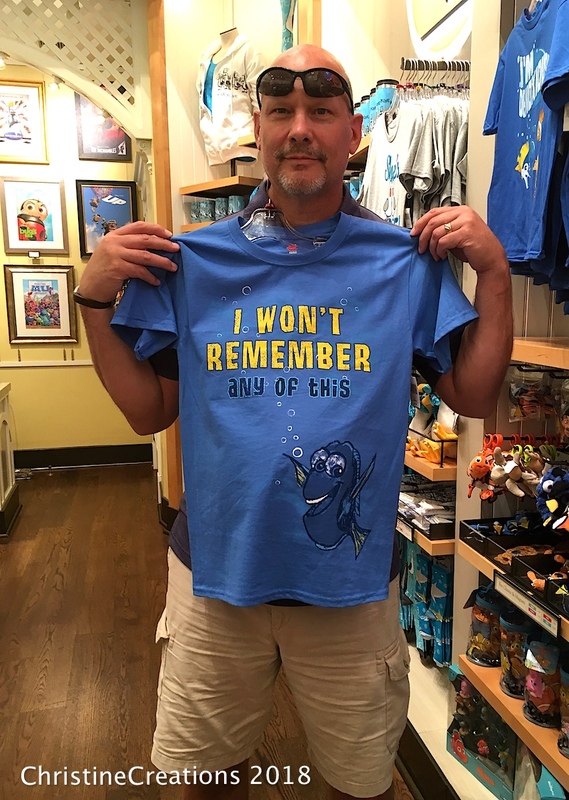 You're never too old for Disneyland! 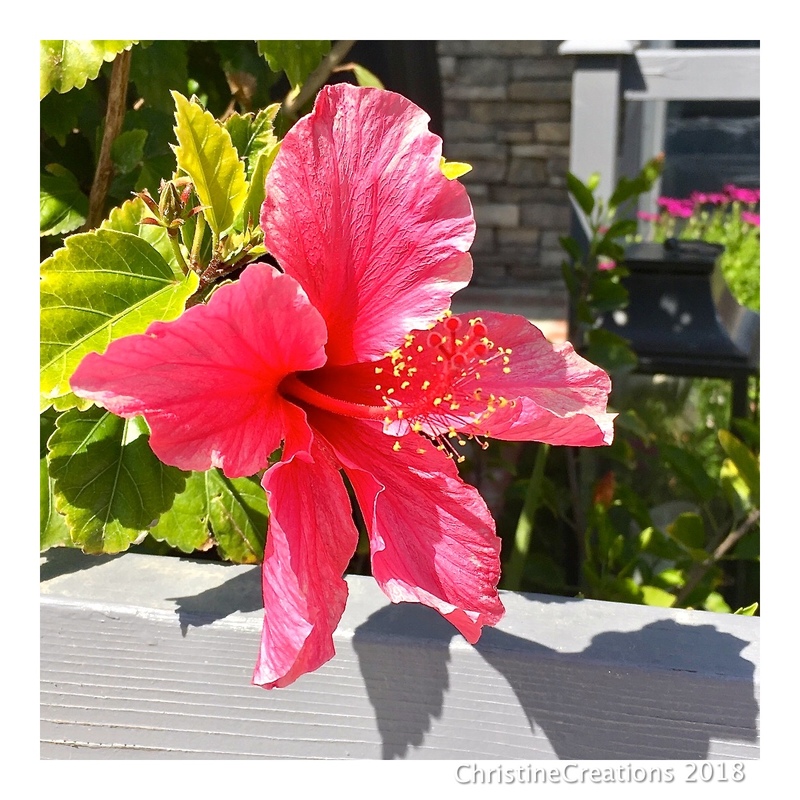 What a great post, Christine. I smiled and laughed all the way through it. New things since we were there. I love those cars! 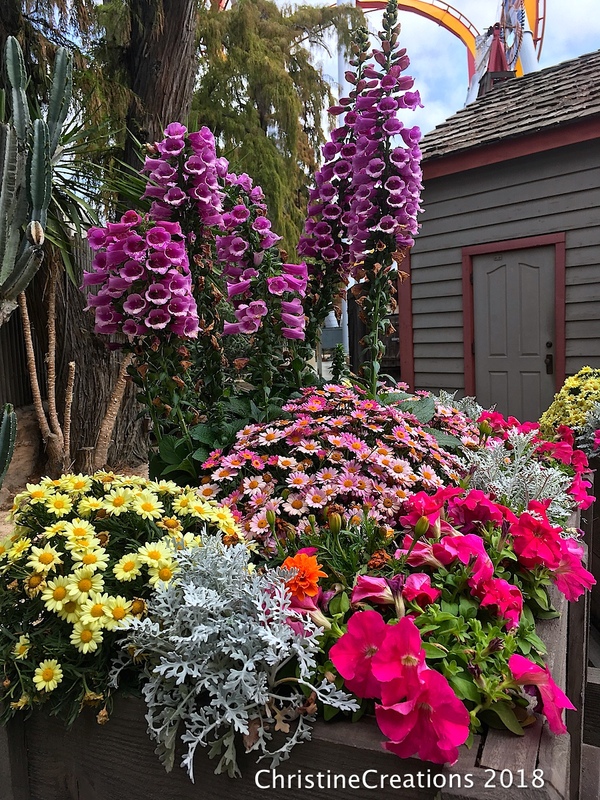 Knotts Berry Farm is such a great place, too. You had an amazing trip and I'm so happy for you!